Visible Ink Press : Which superhero comic book character led to the creation of the popular heroine Elektra in the 1980s? Which superhero comic book character led to the creation of the popular heroine Elektra in the 1980s? He got his "radar sense" power when he was accidentally sprayed by radioactive waste. Some critics have noted his strong resemblance to Spider-Man. He is one of a handful of superheroes who is physically challenged--in this case, by blindness. His alter ego is attorney Matt Murdoch. Daredevil, "The Man without Fear," was the last new major Marvel superhero to come out of the comic company's burst of creativity in the 1960s. It took more than fifteen years for the superhero to become a real fan favorite, but he has enjoyed many fine periods since his introduction. The first Daredevil issue appeared in mid-1964 and the character was the first of Marvel's heroes to be created without the input of either super-artists Jack Kirby or Steve Ditko, but he clearly owed a debt to one of writer/editor Stan Lee's biggest successes, Spider-Man. In a story drawn by veteran comics artist Bill Everett, readers were introduced to a wisecracking, yellow-costumed hero with a big "D" on his chest, who swung around the New York City skyline searching out trouble with his "radar sense"--a scenario that fans of the legendary web-slinger would have found all too familiar. 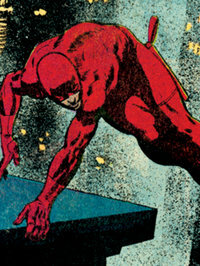 But what differentiates Daredevil from his more famous inspiration is that he has a significant handicap: He is blind. Daredevil's origin, recounted in that first issue, tells of how put-upon bookworm Matt Murdock is blinded by a radioactive canister while rescuing a blind man from the path of an out-of-control truck from the Ajax Atomic Labs. Young Matt, nicknamed "Daredevil" by his high-school tormentors as a jab at his "cowardice" and straggly physique, is the son of washed-up boxer "Battling" Jack Murdock, then on this way back to the big-time through the help of a crooked promoter known, rather suspiciously, as the Fixer. 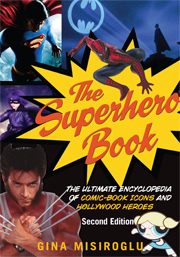 Throughout high school and college, Matt builds himself up physically, aided by his heightened senses (a side effect of the accident that more than compensates for his blindness), and when his dad is killed after refusing to throw a fight, he dons a costume and becomes Daredevil, vowing to bring his father's killers to justice. In addition to his "razor sharp" senses that can hear someone else's heart beating, never forget an odor once it is smelled, tell how many bullets are in a gun by its weight, and distinguish color by its feel, Daredevil's innocent-looking blind man's cane contains a grappling hook and cable for scaling walls. On being confronted by the imposing figure of Daredevil, the Fixer promptly dies of a heart attack, so establishing early on the terrifying effect the hero has on criminals. The first issue also established the strip's supporting cast: Murdock's partner in his law firm, Franklin "Foggy" Nelson, and their beautiful, blonde secretary Karen Page; thus was the classic love triangle set in place. Over the following decade, Lee and other writers built up a formidable and bizarre rogues' gallery for Daredevil, including the Owl, Mr. Fear, Stiltman, the Gladiator, the Ox, Kilgrave the Purple Man, the Jester, and Leapfrog, among many others. The strip also boasted some of the finest talents in comics, including Wally Wood (who introduced Daredevil's famous all-red costume in issue #7), John Romita, and Gene Colan, who would draw the feature well into the 1970s. In typical Marvel fashion, where Daredevil was a fast-talking joker, Murdock was tortured and morose, petrified that his secret identity would be discovered and unable to reveal his true feelings to his seductive secretary. Indeed, to cover up his secret life as a costumed hero, Matt created a fictitious twin brother, the obnoxious egomaniac Mike Murdock, whom he impersonated for almost two years. Throughout the deception, Foggy and Page were convinced that Mike was actually Daredevil, but by the decade's end Matt finally revealed the truth to Page, who promptly fled to Los Angeles to become an actress. Throughout the early 1970s, Daredevil acquired a new love, ex-KGB agent and slinky superheroine Natasha Romanova, a.k.a. the Black Widow, and the pair relocated to swinging San Francisco. After four years of well-crafted crime fighting, including a period when the Widow received equal cover billing, the pair split, with Murdock returning to Foggy in New York and Romanova joining the short-lived supergroup the Champions. While by no means one of Marvel's top-selling titles, the comic of this period was nonetheless invariably one of the company's most readable books, with consistently fine art from Gene Colan, Bob Brown, and rising star inker Klaus Janson. One 1976 issue (#133) even guest-starred celebrity paranormalist Uri Geller, but a more significant development was the introduction two months earlier of the deadly sureshot villain Bullseye, who could make literally anything into a weapon. In 1979, Daredevil issue #158 saw the introduction of a promising young artist by the name of Frank Miller. He took over scriptwriting two issues later, transforming the comic into a fan favorite and changing its direction forever. Miller's art was both cinematic and atmospheric, with a terrific knack of grabbing the reader's attention and not letting go. Miller's first act as writer was to introduce a mysterious female assassin called Elektra, a deadly Ninja-trained bounty hunter working for the evil Kingpin. But, to confuse things, she had also been Murdock's first love, and over the course of the next few years, their complicated and deadly fascination with each other inspired a fanatical following. What had once been just another comic to most readers was now, unquestionably, the most talked-about title in the United States. Miller became the first creative star of the 1980s and the strip's searing, dark, violent, and explosive direction was mimicked across the comics industry. From issue #168 to his last hurrah in issue #191, Miller wove an ongoing, elaborate saga involving the Kingpin, Elektra, assorted Ninjas, an increasingly psychotic Bullseye, and numerous lowlifes and gangsters. In his hands (aided greatly by the talented Janson), New York became almost a character in its own right, with Miller delighting in delineating its totemic water towers, forests of skyscrapers, and fetid backstreets. He also greatly expanded the feature's supporting cast, introducing the chain-smoking Daily Bugle reporter Ben Urich (who guesses Daredevil's true identity) and the blind derelict known only as Stick, a Zen master who had tutored the teenage Murdock in developing his heightened senses. In the course of the epic, Bullseye went mad and Elektra was killed off, although in a final act Miller resurrected her, much to fans' relief. Elektra's popularity inspired a wildly well-received 1986 miniseries written by Miller and painted by Bill Sienkiewitz, and as of 2004 nine different Elektra titles (including reprints and miniseries) have appeared. In 1983, Miller moved over to DC Comics, where he would create another of the decade's standout titles, The Dark Knight Returns (also with Janson's inks); Marvel found him a hard act to follow. In time, another emerging artist, future New Yorker star David Mazzuchelli, joined the title and soon began to make waves with a beguiling combination of Colan's fluidity and Miller's atmospherics. An increasingly popular run was capped, in 1986, by the return of Miller on scripts, resulting in the "Born Again" storyline (in issues #227-#233), which, if anything, surpassed the comic's earlier triumphs. The story saw the return of the long-forgotten Karen Page, now a faded starlet and abject drug addict, who had sold Daredevil's secret identity for the price of a "hit." In the coming months, the Kingpin systematically destroyed Murdock's career, reputation, friendships, and almost his life, but salvation appeared in the form of a nun who rescued the derelict and dying hero. The story's denouement reunited a drug-free Page with Murdock, revealed that the nun was in fact his long-lost mother, and established a new life for America's favorite hero, helping the poor of New York's Hell's Kitchen. In an ideal world, the comic would have ended there--as close to perfection as any superhero comic has a right to be--but, of course, with high sales and an enthusiastic readership, that was never going to happen. Miller and Mazzuchelli left to create the legendary Batman Year One series, and their Daredevil successors have effectively based their work on this period ever since. In 2003, the live-action feature film Daredevil was released to strong box-office and general critical acclaim, particularly from fans who hailed it as one of the most convincing superhero films to date. The film starred Ben Affleck as Daredevil and Jennifer Garner as Elektra; with a supporting cast of Bullseye, the Kingpin, Foggy, and Ben Urich, it is very much based on Miller's vision of the comic. In the post-Miller era, Ann Nocenti teamed up with artist John Romita Jr. (whose father had made his Marvel debut with Daredevil some two decades earlier) for a long run on the comic. Nocenti introduced another female assassin, the schizophrenic Typhoid Mary, brought back the Kingpin, and pitted Daredevil against Marvel's own version of the devil, Mephisto. That team's successors, Dan Chichester and Lee Weeks, revisited the "Born Again" era, right down to the comic's artwork, Murdock's mental breakdown, and the villainy of the Kingpin (yet again). In the 1990s readers were presented with more mental breakdowns, a new Kevlar-armored costume, the return of the hero's mother, his old costume, a brief stint with the secret organization S.H.I.E.L.D., and Daredevil's old pal Stick. By this point, Miller's reinvention of the hero as a dark, tormented, unstable character had permeated the industry to such an extent that strips as diverse as Aquaman, Green Arrow, and Ghost Rider had been given a makeover, and Daredevil was now just one of the crowd. In 1998, after 380 issues, Marvel decided to relaunch the strip from #1 as part of its more mature Marvel Knights line, and recruited cult film director Kevin Smith as writer and soon-to-be new Marvel boss Joe Quesada on art. Smith and his successor Brian Michael Bendis succeeded in making fans sit up and take notice by introducing a new twist--possibly unique in the genre--of revealing Daredevil's secret identity to the world. Following an unsuccessful coup attempt against the Kingpin (him again! ), former deputy Mr. Silke turned himself in to the FBI, revealing to them the one bargaining chip he had: the knowledge that Matt Murdock is Daredevil. Within a day, news leaked out to the Daily Globe, which splashed the revelation to a startled nation. Murdock and Foggy Nelson (who learned of Murdock's secret some years earlier), back together again as law firm partners, responded with a $400 million lawsuit, but no one was convinced by their denials. With Bendis and the photorealistic Alex Maleev creating riveting stories and a strong fan following, Daredevil once more became one of the industry's most innovative and talked-about comics. Ed Brubaker and later Andy Diggle have succeeded Bendis as Daredevil writers.